I recently became head of a large enough department that centrally organising media and resources as a department has become more important. It’s also nice as the manager to see this organised media to get an overview of what’s being taught. The starting point is to setup a department Google (gmail) account. This account then operates many systems for sharing files, videos and pictures. All the staff can then permanently log in to several apps and systems and load, share and view the department files at the touch of a button. A) The HOD gets a regular update of activity. C) Marketing the courses becomes much easier. Youtube is well known but with all my department’s iPads permanently logged into by all teaching staff, videos of student work, video lessons, and course playlists start to appear much more readily. The iPad’s camera, iMovie and most other video apps will stay logged in and upload immediately, including Explain Everything (Whiteboard App). See my Help Docs like this one or this one to get more setup information. Many school servers are difficult to access from iPads and sharing files across the department without lots of emails is challenging. Dropbox is a solution that works well on iPads and shared folders are easy to setup and free. Using the Department Gmail account you can setup a free department Dropbox account and use it to share folders will all the department staff’s own dropboxes. 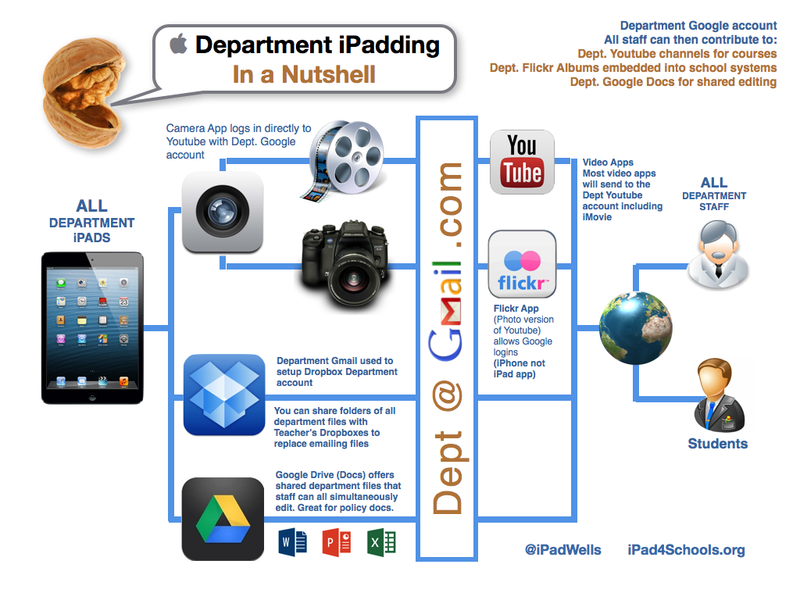 This makes sharing any type of file between iPads much easier as the department folders appear in everyone’s dropbox and nearly all apps will send material and files to the Dropbox app to share with the department. Shared documents for group editing. The creation of Department policy docs, for example, is often a shared duty for a number of department members. With the same Department Google account, you are offered Google Docs (Online Office apps). The new Google Drive app now edits Google Docs and Spreadsheets on the iPad. This is also good form recording Meeting minutes and agendas. Next School resources with Mac’s Pages.